Spectre is the latest James Bond film, staring Daniel Craig as James Bond, Monica Bellucci as Lucia Sciarra, Christoph Waltz as Oberhauser, and Léa Seydoux as Madeleine Swann. Warning: My plot summaries contain major spoilers. The worst spoilers are blacked out like this [blackout]secret[/blackout]. To view them, just select/highlight them. It’s the present day. James Bond is in Mexico at the Day of the Dead celebration. Eavesdropping on a criminal, Marco Sciarra, he hears him mention “The Pale King” and a plan to bomb a football stadium. Bond shoots the bomb, causing it to explode, but Sciarra escapes and Bond gives chase. 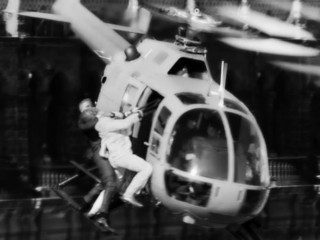 When Sciarra boards a helicopter, Bond leaps aboard and, after stealing Sciarra’s unusual ring, throws him out of the helicopter. Back in London, M is furious at Bond’s unofficial activities and suspends him from duty. Moneypenny visits Bond at home and asks him what he’s up to. Bond shows her a video from the previous M asking him to assassinate Sciarra and then attend the funeral. On M’s orders Q tags Bond with a nanotechnology tracker, but agrees that he will cover for Bond for forty-eight hours, while he goes to the funeral in Rome and gives Bond a watch packed with explosives. At the funeral, Bond meets Sciarra’s widow, Lucia, and saves her from assassins. Lucia tells Bond about a meeting of her husband’s criminal associates that evening, and Bond infiltrates the meeting. There he witnesses a brutal murder by the enforcer, Mr. Hinx, and is then recognised by the organisation’s head, Franz Oberhauser, and has to flee, chased through Rome by Mr. Hinx. Bond eventually escapes using his Aston Martin’s ejector seat. Moneypenny tells Bond that “The Pale King” is an alias of Mr. White, from the Quantum organisation Bond had previously tangled with. Meanwhile, M’s rival intelligence chief ‘C’ attempts to create a worldwide, total-surveillance organisation called ‘The Nine Eyes’, but loses by one vote, to M’s relief. Bond travels to Austria to find Mr. White, who assumes Bond is there to kill him. He tells Bond it’s too late, as he’s already dying of radiation poisoning. Bond realises Mr. White’s last concern is to protect his daughter and persuades him the best way to do that is to tell Bond where she is. 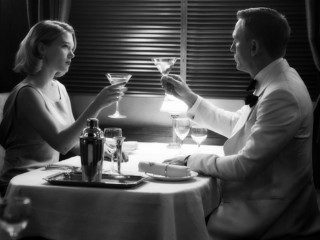 Mr. White tells Bond his daughter, Madeline Swann, works at a clinic in the Alps, and Bond should ask her about “L’American”. He then kills himself. Bond meets Madeline at the clinic, but she won’t cooperate and is then kidnapped by Mr. Hinx. Bond rescues her after a plane and car chase and takes her to meet Q. Q examines Sciarra’s ring and discovers files linking Oberhauser’s organisation with Bond’s previous missions. Madeline tells Bond the organisation is called “Spectre”, and that “L’American” is a hotel in Morocco that her mother and father used to visit annually. Bond and Madeline travel to the hotel and stay in the same room her mother and father used to stay in. That night, Bond discovers a secret room containing a computer with the co-ordinates of a facility in the desert that isn’t on any maps. Bond and Madeline travel into the desert by train. While on the train they’re attacked by Mr Hinx, who’s about to kill Bond when Madeline shoots him. Bond then throws Mr. Hinx off the train. Later, Bond and Madeline become lovers. The plot of Spectre all hangs together rather well, with a few ‘movie logic’ exceptions, such as brutal fights leaving no visible marks on people, stormtrooper-level marksmanship by the bad guys, and people appearing and disappearing a trifle conveniently. 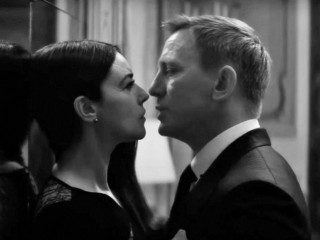 With actors of the calibre of Daniel Craig, Monica Bellucci, Christoph Waltz and Léa Seydoux, a character-focussed script and a good director, this is the strong point of Spectre. Daniel Craig’s reading of the Bond character has become steely, with less of the hints of vulnerability he had in his earlier films. He is now the hard, professional assassin who kills without compunction. Monica Bellucci only has a cameo role, which is a shame as she’s rather good in the little we see of her. Similarly, Christoph Waltz doesn’t actually get a lot of screen time either. There’s a possibility that he might be back though, we will see. I hope so as his character certainly has a lot of potential. And Léa Seydoux is excellent – the best actress in a ‘Bond girl’ role since Eva Greene’s Vesper Lynd. Spectre is about death, literal and metaphorical. The story begins at the Mexican Day of the Dead, proceeds via endless motifs of death (a funeral, the walking corpse of Mr. White, a clinic) and ends with several dilemmas for Bond, all involving whether to choose life or death. It seems that there are two forces competing for Bond’s soul: death, literal and spiritual, in his chosen profession; and life, personified by Madeline. The word ‘Spectre’ itself means ghost, and the ghosts of Bond’s past return to haunt him and, if they can, drag him after them. This gives the film its emotional impact. Like Skyfall it has some depth. Even compared to Skyfall (which saw the return of Q and Moneypenny) Spectre has a lot of Bond film clichés, or tributes, depending on how you see it. Whether you regard that as a good thing or not probably depends on your taste. The structure of the film has very much returned to the classic Bond ‘formula’, after the more experimental earlier Daniel Craig films. One cliché did make an entirely unwelcome return: during the car chase in Rome, there’s a comedy moment that would have slotted in well in a Roger Moore Bond film. I’m not sure what they were thinking there. The Sam Mendes Bond films have been less frenetic than some of their predecessors. Scenes are allowed to breath, making Spectre a relatively long film: two and a half hours. The cinematography though, as you might also expect from Mendes, is fabulous. The set-piece action scenes are excellent, particularly the opening sequence with the helicopter, and the air/plane chase in the Alps. The car chase in Rome is perhaps a little underwhelming, being played for laughs a bit too much for me. The hand to hand fight between Bond and Mr. Hinx on the train is brutal. The denouement of the movie though is not very action-packed but focusses more on Bond’s dilemmas. A blast, and with more depth than most Bond movies. If you loved Skyfall, you’ll almost certainly love Spectre too. Spectre is available on Amazon USA here and Amazon UK here . If you’d like to discuss anything in my Spectre review, please email me. Otherwise, please feel free to share it using the buttons below.